These delicious baked bell peppers are a simple Mediterranean dish coming from the Sicilian and Ligurian regions. I love to serve them to my guests, not only because they are so colorful, but because they get so excited anticipating what’s inside. I surprise them with different ingredients stuffed inside each time. The aroma when they are being baked fills the kitchen especially when they are filled with ground turkey then seasoned with breadcrumbs, garlic and olive oil…but also when they are only stuffed with just rice or only with cheese. It’s such a versatile dish and can be made for meat-eaters or vegetarians alike. Delicious and easy to make, these remind me of being at my Mama’s dinner table back home. Authentic Italian Tip: You may think of Pepperoni as the spiced salami that goes on pizza, but Peperoni actually means bell peppers! Slice the potato into 1/4-inch slices using a mandoline. Transfer to a large shallow pan and coat generously with olive oil. Add salt and pepper to taste and bake at 400º for 20 to 25 minutes. In a large skillet sauté olive oil and garlic for approximately 1 minute on medium-low. Add the San Marzano tomatoes, salt and pepper and cook for 15 minutes, stirring occasionally. Remove from heat and set aside. In a large skillet heat olive oil and add turkey. Add the finely diced green bell pepper and brown the turkey for approximately 7 minutes, stirring continuously. Cut in half vertically the bell peppers keeping the stem, discard the seeds. In a baking pan spoon the tomato sauce on the bottom and add the bell peppers with the hollow sides facing upward. In a bowl mix the browned turkey, 4 tablespoons of the tomato sauce, breadcrumbs, Pecorino Romano, garlic, salt and pepper. Spoon equal amount of the mixture into each hollowed pepper. Cover with aluminum foyer and bake for 45 minutes, remove aluminum foyer and bake for an additional 15 minutes or until the peppers are tender. Transfer to serving plate and sprinkle the top with the remaining Pecorino Romano, garnish with the sliced potatoes. Influenced by memories in the kitchen with his mother and grandmother, Italian-born Francesco Romano is the man behind the food blog, Coco de Mama. He shares recipes and culinary knowledge with Mazzoni fans each month. Meatballs are served as a main dish or in soups all throughout Italy. Almost every country in the world has their own version of a meatball. Italian-Americans created their own main dish of meatballs served with spaghetti, which is something I had never seen before in Italy. With this recipe, I remembered how much I loved these little treats that Mama used to make for me when I was a boy, so I wanted to create something with a little surprise in the middle, that would be fun and delicious for both kids and adults. Panfried meatballs are an Italian classic made with beef and/or pork, with Pecorino Romano, parsley and garlic and breadcrumbs. With this recipe, I made them into small oval shapes and filled them with fresh mozzarella, so when you bite into them, they ooze out with the creamy cheese. Served with an arugula and tomato salad, it’s a perfect Italian dinner that your whole family will love. If you are having a cocktail party, you can pierce each little polpette with a small skewer and serve them as a bite size appetizer. Enjoy this delicious and versatile staple of Italian cuisine. In a large bowl, thoroughly combine all the ingredients above except for the olive oil and mozzarella. Using your hands, roll the meat into golf ball sized meatballs. With your finger make a hole in the center and place a cube of mozzarella. Cover the cheese with the remaining meat, and shape into an oval. Fry the meatball for about 3 minutes on each side. Until meatballs are golden brown. Drain on a paper towel and serve warm. Note: Eat them while they’re hot! Coming from the regions of Basilicata and Puglia, Panzerotti are fried dough filled with simple ingredients. When the yeast-dough hits the oil, they puff up and quickly cook whatever delicious ingredients you have filled them with. You can make them larger and serve them as a nice lunch, or as I show you below, they can be made into small, appetizer sizes and filled with the traditional tomato and mozzarella (called Panzerotto Materano). Adults and children alike will devour these delicious bites. Get out your rolling pin and let’s get started! Dissolve the sugar and yeast in 1/2 cup of lukewarm water. Add the salt to a 1/2 cup of warm water. Sift the flour in a large bowl. Add the salt water and yeast mixture to the flour and combine until the mixture turns to a soft ball. Transfer the dough to lightly floured board and knead for about 5 minutes until the dough is smooth and elastic. Divide the dough into about 20 balls and place them onto baking sheets, leaving generous space around each. Cover the trays with a clean cotton towel and set in a warm place to rise for about 2 hours, or until they double in size. Gently flatten each ball into a 5-inch circle. Place some tomato, mozzarella and a basil leaf (or other ingredients of your choice) into the center of the circle. Season with salt and pepper and brush the edges with water. Fold each one over and seal the edges together and eliminate excess dough with a dough cutter. Repeat with the remaining balls and filling. Heat the grapeseed oil in a deep fryer or deep saucepan to 350°. Place a one or two panzerottini into the oil in batches and fry for 2-3 minutes on each side, until both sides are golden brown. Drain on paper towel and serve immediately. Roasted bell peppers are a staple in Italian cooking, and are at their most flavorful from July through November. I was reading an article by Russ Parsons of the Los Angeles Times, about how to choose the best bell peppers, which inspired me to create this recipe. I used his suggestions and went to the farmer’s market to find the perfect bell peppers to roast. While there, I asked the butcher for a pork tenderloin to go with my peppers. Most people associate pork with apples, but instead I thought a nice and flavorful accompaniment would be to make a roasted gold and red pepper sauce. I grabbed some fresh tarragon and found some imported Sicilian pistachios and I was on my way back to the kitchen to create this recipe. The aroma of roasting peppers and blending them with fresh tarragon will infuse your house with the most delicious scent. Once again, the Italian philosophy of simplicity and using the freshest ingredients made an incredibly flavorful and beautifully colorful dish. I hope you enjoy this simple and fresh recipe and share it with your friends and family. Preheat the oven to 500°. Place the roasting pan with the bell peppers on the rack. Roast, turning occasionally, until they blister and darken on all sides, about 20 to 25 minutes. Remove the peppers from the oven and place in a bowl. Cover tightly with plastic wrap and let stand for 20 minutes. When cool enough to handle, remove the skin and slice them open. Remove the seeds and discard. Place peppers and tarragon in a food processor and blend until creamy. Combine the garlic, rosemary, thyme, salt, pepper and olive oil in a small bowl. Rub the pork with the mixture and olive oil. 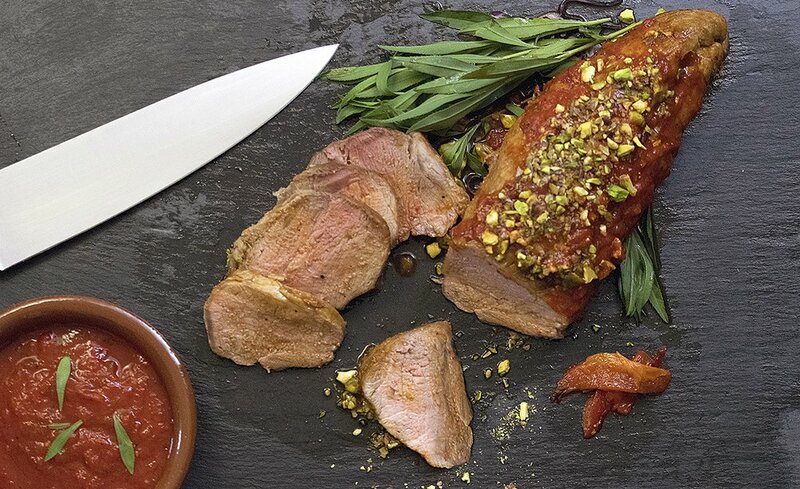 Place pork tenderloin on a baking sheet and transfer to the oven. Cook until an instant-read thermometer reads 145 degrees. Remove the tenderloin to a platter, cover and let it rest for 10 minutes. Warm up the pepper-tarragon sauce. 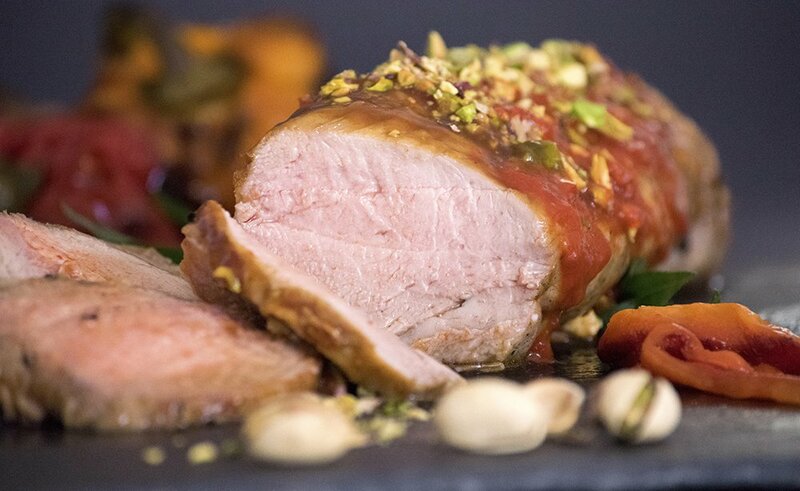 When the pork has rested, pour the sauce on top, sprinkle the pistachios and serve. Parmigiana That You Can’t Resist! I first realized how good Parmigiana was when I was 5 years old, sneaking in the kitchen while my Nonna was frying the eggplant. I would hide under the table and when she was distracted, I would grab one from the plate and run like a rabbit. It tasted like candy to me and I couldn’t resist them…and guess why? Because they were fried. In fact, frying eggplant makes them become sweet and creamy. Growing up, I was concerned about the calories in this dish, but i would rather have a small amount of delicious freshly prepared food than a huge amount of bland food. So I created these perfectly sized, round-shaped parmigiana that are the delicious and fulfilling. Authentic Italian Tip: Serve it with grilled whole wheat crostini to dip in the sauce. 1 cans peeled San Marzano Tomatoes crushed by hand. Frying the eggplant: Slice the eggplant into 6 pieces about 1/2-inch thick. Lightly season each round with salt and pepper and place aside. In a skillet, fry the eggplant slices at 325º until the slices turn deep brown on the bottom. Flip them and continue frying until the other side is the same color, about 3 to 4 minutes. Remove the eggplant slices from the pan and place them on a plate lined with paper towels. Let them cool. Simple tomato sauce: Heat the olive oil over medium heat. Add the garlic and cook for about 3 minutes. Do not burn! Add the tomatoes and salt and bring to a boil, stirring often. Lower the heat and simmer for 30 minutes until thick. Remove from heat and let it rest. 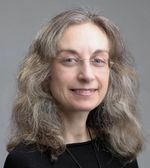 Assembling and layering: Place a 6-inch diameter by 2-inch round metal shaping ring into a shallow pan and add a tablespoon of tomato sauce to the bottom. Layer inside the ring adding a slice of eggplant, 1 tablespoon of tomato sauce, a teaspoon of basil, one slice of mozzarella and sprinkle with 1 teaspoon grated Parmigiano-Regiano. 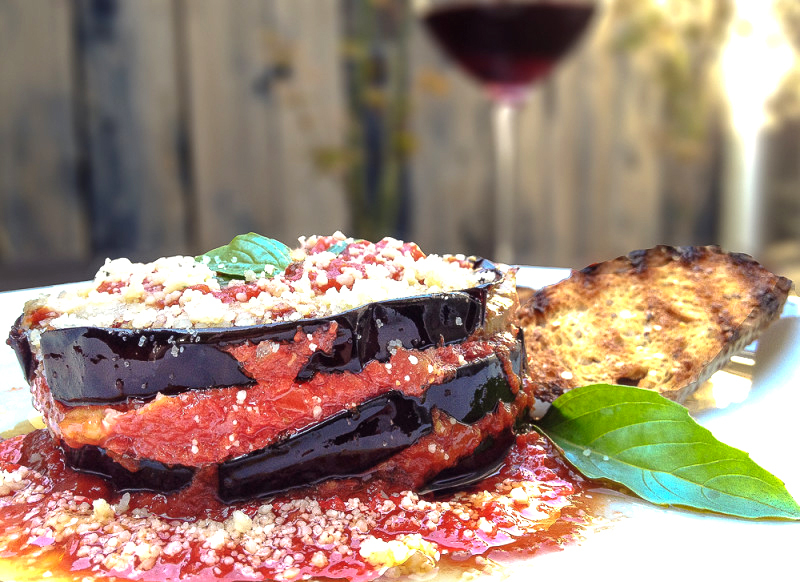 Repeat the layering process using 3 slices of eggplant per ring. Sprinkle some Parmigiano on the top. Baking: Heat the oven to 350°. Put the layered eggplant in the oven and cook for 20 minutes. Carefully transfer the eggplant to a plate and remove the metal ring. Add a sprinkle of Parmigiano to the top and serve immediately with the grilled crostini. 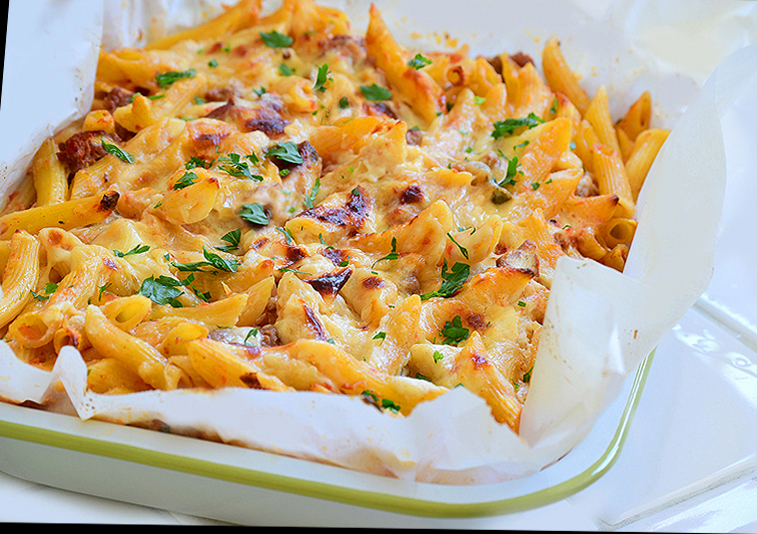 There is something so comforting and satisfying about a baked pasta recipe. I guess it reminds me of home, when Mama used to make it for the family almost weekly. I also used to order it at restaurants in Milan, but it originates from the Emilia Romagna region of Italy. This particular dish is so easy to make and can feed a hungry crowd that will be so pleased once they bite into the pasta with creamy besciamella and light ragu. When you’re short for time, you can also make this ahead and freeze it, then bake it when your guests arrive. If you leave out the ragú, it is still delicious and will satisfy any of your vegetarian guests. Heat oil in a large dutch oven over medium heat. Add the onion. Cook until soft, about 12 minutes. Add the meat and sauté, breaking it up with the back of a wooden spoon, stir until browned, about 10 minutes. Add the wine and stir until it evaporates completely. Scrape all the browned bits from the bottom of the pot and add the San Marzano tomatoes, stir to incorporate. Reduce heat to low and simmer, stirring occasionally for 30 minutes. Season with salt and pepper to taste. In a large non-stick skillet melt the butter over medium heat. Stir in the flour and incorporate. Cook for 2 minutes. Gradually add the simmering milk and whisk to combine. Whisk continuously, when the sauce is creamy and smooth, turn off the heat and add the Parmigiano-Reggiano. Add the penne and cook for about 5 minutes, it will not be cooked, but will finish in the oven. Return pasta to the pot and add the besciamella and the ragú sauces, mix well until all the pasta is thoroughly coated. Pour the pasta into a greased 9 x 13-inch baking dish (or use parchment paper for easy pull up) and bake in the oven for 20 minutes or until bubbling and the top turns golden. Remove from oven and sprinkle the reserved Parmigiano on top. Let rest for 15 minutes before cutting and serving. Leftovers are a fact of life, but what are we to do with leftover pasta? 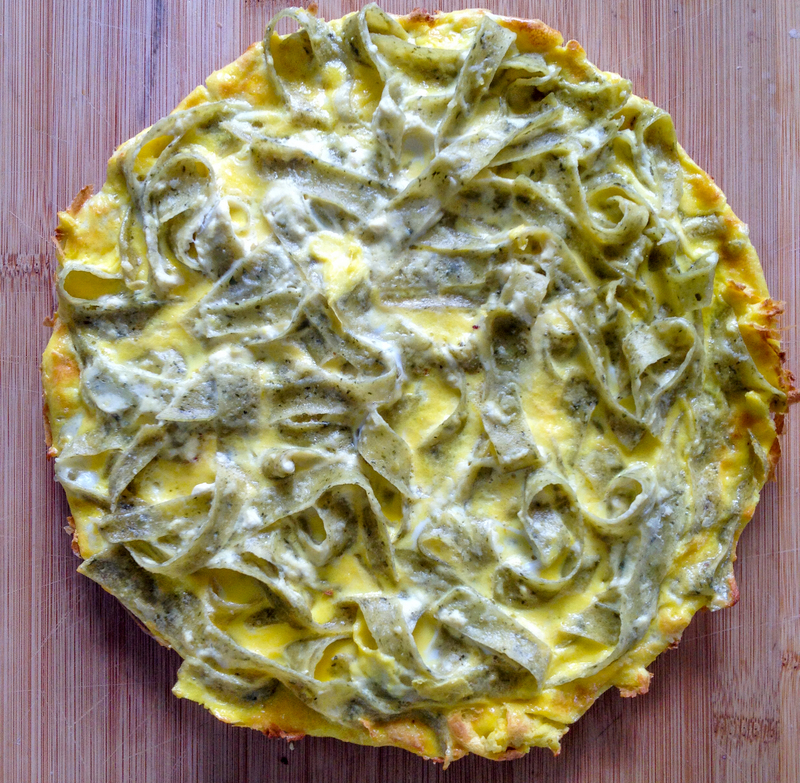 Every Sunday morning, my mother would make a four-egg batch of pasta dough and usually cut it into tagliatelle. She also prepared a pot of tomato and meat sauce. 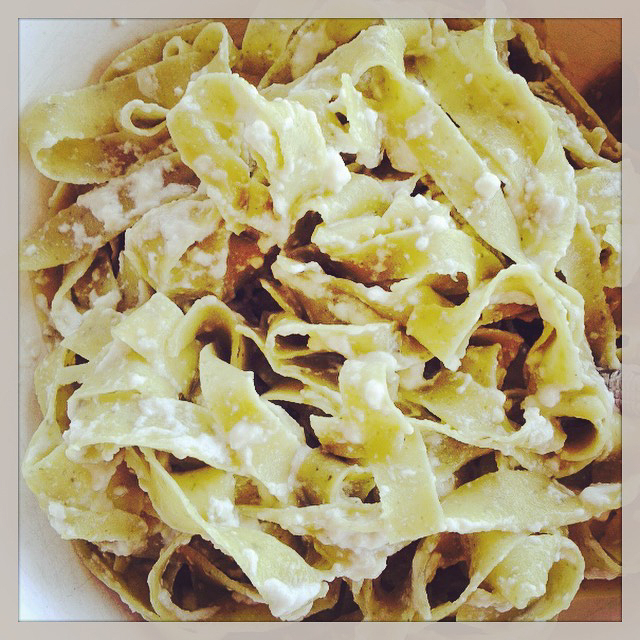 At lunchtime, she cooked all the tagliatelle, knowing that half would be left over. The day after, she prepared them ripassate in padella, meaning she heated some olive oil in a skillet and tossed the cold pasta in it, sautéeing it until it was nice and hot. What I liked about the result was that some strands became crisp and the sauce acquired a deeper flavor. For my first vacation away from my parents, when I was 16 years old, I spent 10 days or so in the Calabrian city of Rossano. One day, my host prepared spaghetti, and I noticed that she set some of it aside, then dressed the rest and brought it to the table. The day after, she made a frittata with the spaghetti she had set aside. It was a revelation. I kept that memory with me until I started making my own version of frittata di pasta, usually with pasta left over from a meal, hence dressed. The nice thing about it is that the frittata is a bit different every time, depending on the kind of pasta and how it was dressed. For the rendition shown here, I used some tagliatelle verdi with ricotta, made according to the recipe in my previous post. 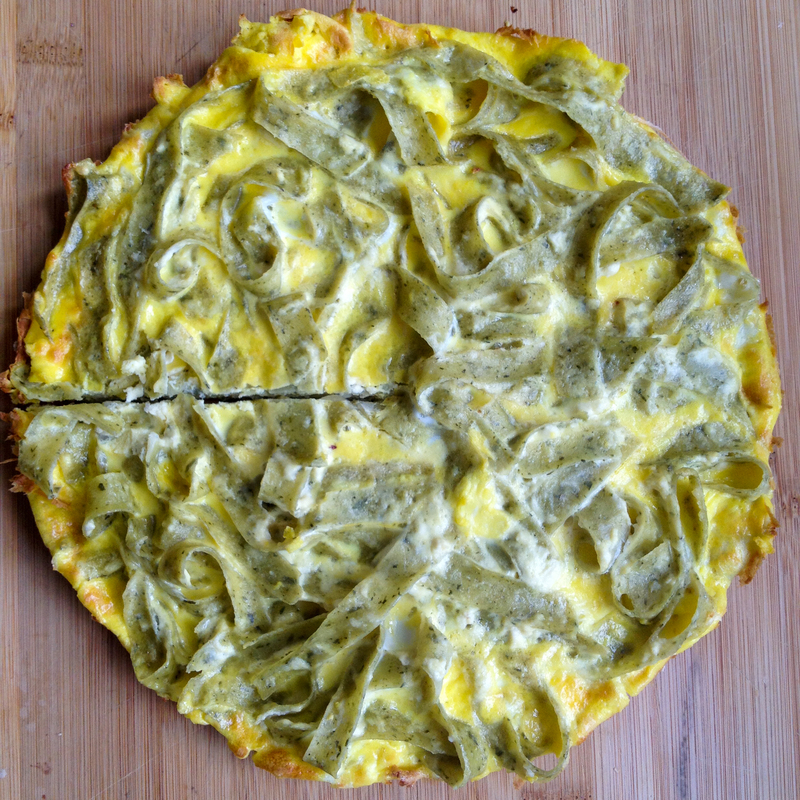 A portion was eaten right away and the following day I used the rest to make the frittata. Consider the below as more of an invitation to be creative with what you have available than a recipe. Adjust the number of eggs and pan size to the amount of pasta at hand and choose a cheese that you think pairs better with the pasta (whose original dressing may include some cheese, something to take into account in the planning). 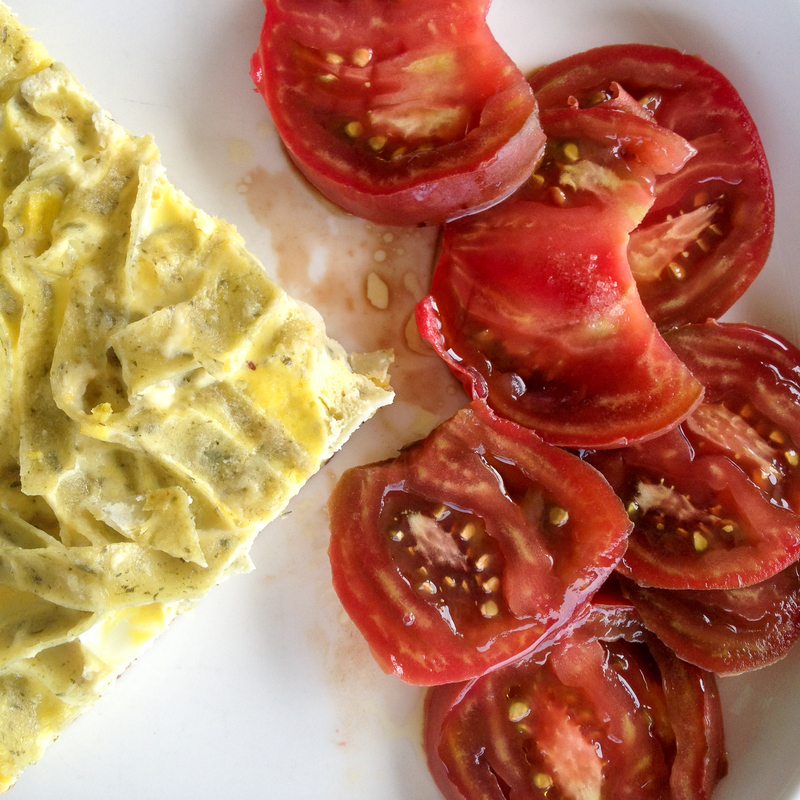 A wedge of the frittata served with a simple heirloom tomato salad makes a lovely summer lunch. Oil a 10-inch oven-proof skillet and warm up. Add the leftover pasta. Warm up the pasta and lightly sauté it for a couple of minutes, stirring every now and then. In the meantime, break the eggs in a bowl and whisk them lightly until just blended. Add the salt and whisk briefly. Add the water and whisk lightly to incorporate. Add the grated cheese to the eggs and whisk lightly to incorporate. If you use the sliced cheese, hold on to it until later. Turn on the broiler. If your oven allows it, choose the “low” setting, otherwise, move a rack to the lowest position. Pour the eggs slowly into the skillet. With a fork, gently arrange the pasta so it is evenly distributed. Cook over low heat. After the edge is set, run a spatula under it and shake the frittata gently to ensure the bottom does not stick to the pan. Evenly distribute the sliced cheese on the surface. When the eggs are set, place the skillet in the oven, leaving the door ajar, for 3 minutes. Take the skillet out of the oven (don’t forget that the handle is hot) and let rest of a couple of minutes, then slide the frittata onto a serving plate. Cut into wedges and serve.